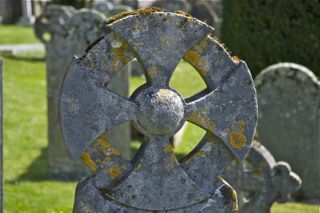 Above the church in the graveyard there is a Celtic cross which has been dated as C8th or C9th but it is unlikely that a hermit or Cornish saint resided here. The place name means dwelling of Connoc, probably a warrior rather than a saint. By 1086 the manor was held by Osfrith and the church probably started life as a manor chapel. In 1266, the De Cantias family had the right to appoint the priest and by 1321 this right passed with the manor to the Carminows. The Bishop of Exeter rededicated the church and the rector, William Parry, went off on study leave to Paris for 2 years. The church might then have been cruciform, having started off as just a chancel and nave. The south aisle was added not long before the Reformation to allow processions round the church on Sundays and feast days and part of the screen which divided nave from chancel survives. Boconnoc also had a tower and three bells and a north chapel by the time the Mohuns bought the manor c.1541. They endowed the church with a splendid altar table carved with the words “Made by me Sir Raynold Mohun 1621”. There are two votive tablets above the main aisle showing Penelope nee Mohun praying for the life of her baby son. Unhappily they both died and on the east wall of the church there is a memorial to her with lovely words below it and the date 1637. In 1643 the Battle of Bradock Down was fought nearby and after the Royalist Victory Charles 1 wrote a letter to thank all Cornish parishes. A fine copy of the letter is above the door and his Royal arms are still displayed on the west wall, a poignant reminder of the fact that Charles stayed here in 1644 during the Battle of Lostwithiel. The pulpit is decorated by cherubs playing lysarden, instruments only used early in the 17th century. Perhaps the loveliest features in the church are three windows on the south wall. Their colours are delightful and they are clearly in the best Pre-Raphaelite tradition. Made by Burlison and Grylls they could have been designed by Eleanor Fortescue Brickdale. The church acquired its present octagonal bell turret in 1829 and a west gallery and was “restored” by St Aubyn in 1873.